Let’s take the most obvious question first, why is a suburban white man even watching a “Madea” movie? Honestly, I love them. They’re funny, poignant, well acted and generally contain a good nessage. Sure they’re also ham-fisted, over the top, and pretty one note- which is in a way part if their charm. No one is saying Tyler Perry is making high art here, just telling good stories through a perspective that’s not widely seen. 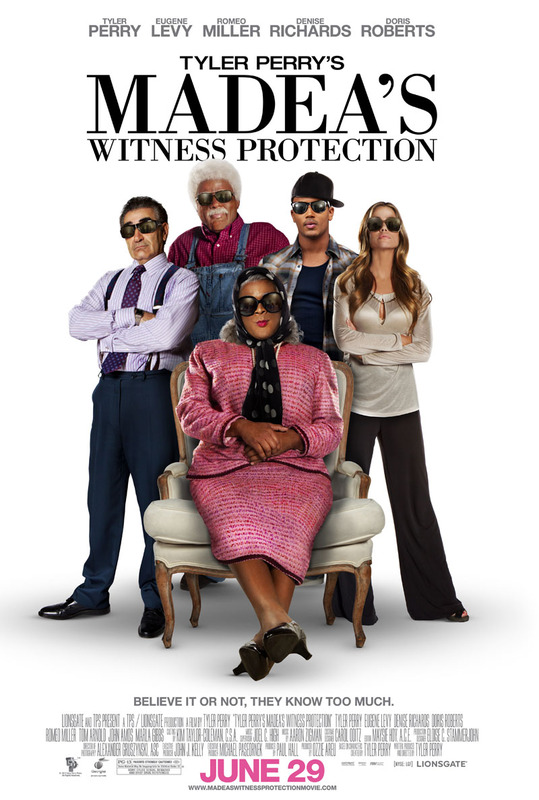 Which is why “Madea’s Witness Protection” is sucha massive dissapointment on every level. Even the poster is barely trying. In this film, Eugene Levy and his rich Connecticut family (including newish bride played by Denise Richards and senile? mother played by Doris Roberts) have to go into witness protection after Levy is framed for a Ponzi Scheme (by Tom Arnold, for some reason). Levy’s lawyer, Perry’s Brian from previous films, decides to stash the family with his aunt Madea and father Joe (both also played by Perry). Culture clash based hilarity (Richards does yoga! The family doesn’t eat carbs! They’re white AND Jewish!) desperately tries to ensue. We’ve all seen variations on this idea in the past and this film does nothing new or different to it. If anything, it may help to end the genre. For “originality” there are also 2 subplots that to varying degrees go absolutely nowhere. One is related to the main story in a complicated and ultimately pointless way, and the other is summarily dropped for no reason but manages to be vaguely racist first. Comedy! *Come to think of it, few of Tyler Perry’s films actually end. They just sort of…stop. “I can do bad all by myself” is a truly egregious example of this as the film just breaks into a parade for NO REASON and then ends. At least “Madea’s Family Reunion” has the most over the top wedding EVER (seriously, women and WORKING PIANOS are literally hanging from the ceiling as DECORATIONS) to close out the story. ← Previous Post Even. More. Stuff! This is sad to hear. I had high hopes for it even though the storyline and actors (Denise Richards etc.) always seemed a little weak. Regardless, I will always have a special place in my heart for Madea.